As Robert Parker has his Spenser, so does James Patterson have his Alex Cross. As Parker did, and is still doing, with Spenser, so does Patterson with Cross --- make him better with every book and make every book better as well. ROSES ARE RED continues in that tradition. 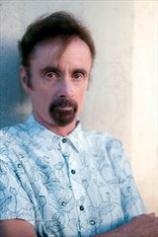 There are few living writers who could meld the dual terrors of nature run amuck and tragedy in one's waning years with such comic affluence and literary invention as the wondrously funny T. C. Boyle. A FRIEND OF THE EARTH, Boyle's latest, is yet another in his pantheon of achingly disturbing facts of life in our age that are just ripe for the comedic picking. He made good stead of dangerous winds, roiling rains, and an environment that is on the verge of total Biblical collapse --- the world of 2025 is dismal --- yet A FRIEND OF THE EARTH serves as a friendly cautionary fable of what we may expect should we choose not to mend our nasty worldly ways. Ty Tierwater, a quiet staid happy guy in the '80s and '90s --- "the slow-rolling glacier of my old life, my criminal life, the life I led before I became a friend of the earth" --- becomes part of an ecoterrorist organization named Earth Forever! His second wife becomes a slave to the cause, and his daughter a casualty of it (her name is Sierra, so you know she's in trouble); but after all is said and done --- Ty does jail time, takes a job with a wacky rock star managing his personal zoo --- suddenly, just when it seems he may fall into a rightfully deserved and timely death, his great love returns. And his world, like the world around him, turns topsy-turvy. 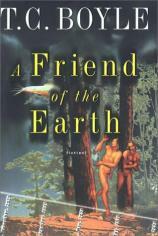 "To be a friend of the earth, you have to be an enemy of the people." Ty's proclamation underlines the essential struggle of all the characters. Who can find time for love in the midst of all this radical craziness? If the trees need all your attention and love, what is there left over for the humans that abound? T. C. finds a humor and latent strength in Ty that keeps us interested in what is going on with him. Between many bright and laugh-out-loud comic travails, Ty finds that maintaining a balance, ecologically or romantically, and an impassioned and one-sided search for the truth is a human's ultimate downfall.